10 of the most unique Ski Resorts to visit this winter! This quirky ski area opened back in 1948, with all trails hand cut - and a single chair lift. It now operates as the country's only skier-owned cooperative. The Glen's appeal lies in the challenging terrain and its "no frills" approach. Just know that conditions are heavily reliant on the weather: they don't make much of their own snow. By the way, it's the only ski resort in America listed on the National Register of Historic Places! Just 27 miles from Anchorage, its the 49th state's largest ski resort. Nestled in the Chugach Mountains, it's unique in that you can frequently see the ocean from the slopes! The scenic drive to get there runs alongside an inlet filled with ice floes and whales breaching from the water. There's not a ton of nightlife, but with such breathtaking scenery and snow that lasts way, waay into the spring, who cares? In the early 20th century, artists like Georgia O'Keefe and Ansel Adams fell in love with this desert town and made it their home base. Taos is ringed by the Sangre de Cristo Mountains which offer some of the most challenging skiing in the country. But when you're off the slopes, you can indulge in a ton of fascinating galleries and museums. Modeled after some of Europe's top resorts, Squaw Valley was the site of the1960 Olympics. There are excellent views of Lake Tahoe, and terrain suitable for skiers of all levels. It regularly gets fresh snow that hangs around far into the spring, making it one of the longest ski and snowboarding seasons in the U.S. Oh yeah, and they have a "ski-through" Starbucks! This family-owned ski area is located just outside a 19th-century mining town. Most of the runs are rated "black" or "double black," but there are about a dozen that are suitable for beginners. Afterwards, wander into the restored downtown of Phillipsburg which features the Opera House Theater and funky little shops, including an old-fashioned candy store. It's just 60 miles from the Canadian border, with some of the most amazing scenery in the Rockies. Schweitzer is on private land, leased by the U.S. Forest Service. So your runs (none of which are too difficult) will take you through amazing glades. When conditions are clear, the mountaintop views span three states, plus British Columbia. Families love this low-key resort because its economical, never crowded and its 65 runs have something for everyone: bunny hills to double-black tree skiing. The historic town itself is fun to explore. Buffalo Bill and Calamity Jane once hung out here, and despite the usual art galleries and coffee shops, the frontier spirit hasn't changed very much. Adrenaline junkies love this 9,000-foot mountain in one of the fastest-growing ski areas in the country: 60 percent of the runs are rated "black" or "double-black." Because the mountain is skiable on all sides, there are some areas suitable for those who want something a little less intense. If you don't want to get your heart rate up that high, you can always just hang out in downtown Bend, nicknamed "Beervana" for its numerous microbreweries. Located just outside of Salt Lake City and established in 1938, its one of the oldest ski areas in America. The terrain is among the most diverse in the country and notably challenging. Even experienced skiers are encouraged to first check it out with a local. 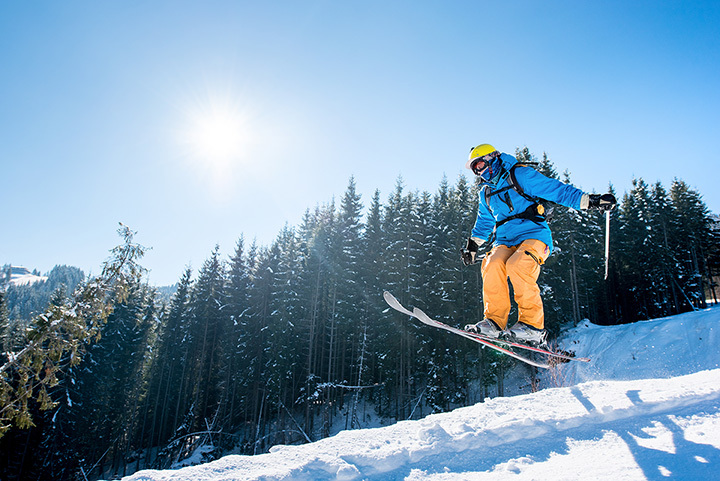 There's a "no snowboarding" policy, which many skiers will welcome. And they are big on maintaining the snow, so powder conditions are always sublime. Located on Mount Hood, it's the only resort in America that offers skiing all year round! You can thank the Palmer glacier for that. Many ski and snowboard pros use Timberline as their summer base, training and trying out new stunts. Oh, and don't be spooked that the historic lodge was the location for Stanley Kubrick's film version of The Shiningâ€¦!